Thank you to the 102 poets from Australia, Canada, Czech Republic, England, France, Ireland, Italy, New Zealand, Pakistan, Peru, Scotland, Spain, Sweden, United Arab Emirates, and across the United States who contributed their work to the Silver Birch Press Mythic Poetry Series, which ran from October 1-November 30, 2014.
at my father’s departmental holiday party. “Of course we planned you,” said my mother. a diaphragm baby. It’s good to be pushy. I’m a celebration! I’m a little Dionysius. I’m what happens when you let down your guard. a one-woman OOPS! with a radium glow. I’m truth and beauty, a force for chaos. If you don’t like it, kiss my assertiveness. a twinkle in the conceptual storm’s eye. so bottoms up, not belly-up. and imbibe the spiked Kool-Aid. you can shatter your own chrysalis. Shine like the Aurora Borealis. Bathe your baby soul in real cabernet. NOTE FROM THE AUTHOR: “In Vino Veritas” is a tribute to Dionysus, the Greek God of wine. 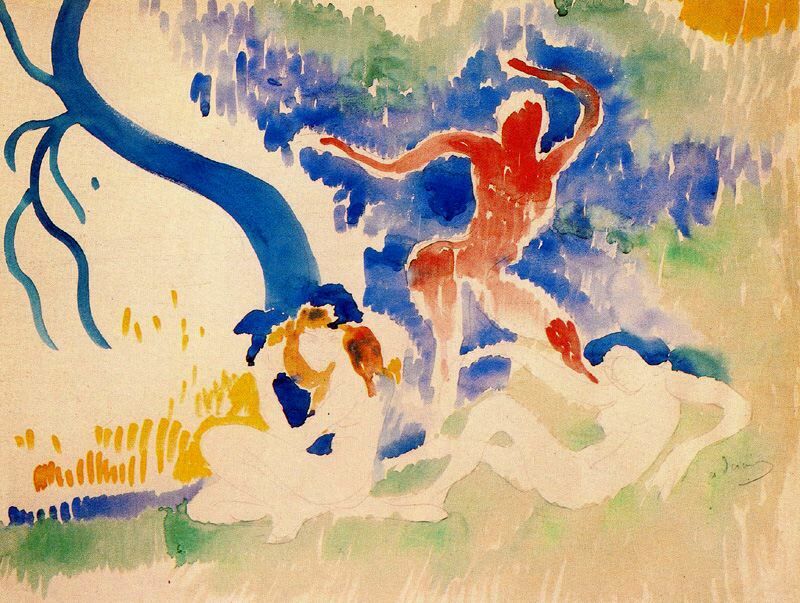 IMAGE: “Bacchus Dance” by André Derain (1906). ABOUT THE AUTHOR: Jan Steckel’s full-length poetry book, The Horizontal Poet (Zeitgeist Press, 2011), won a 2012 Lambda Literary Award. Her story Mixing Tracks (Gertrude Press, 2009) won the Gertrude Press fiction chapbook award. Her chapbook The Underwater Hospital (Zeitgeist Press, 2006) was voted First Place in the lesbian and bisexual poetry division of the Rainbow Awards. Her creative writing has appeared in Scholastic Magazine, Yale Medicine, Bellevue Literary Review, Red Rock Review, The Pedestal Magazine, and elsewhere. Her work has been nominated three times for a Pushcart Prize. Her short story collection Ghosts and Oceans is seeking a publisher. The neighbor’s cat has caught a baby hare. like a kitten while she plays with it. enough to elude the blade of a sword. against the building’s implacable bricks. to feel the conquering hero. ABOUT THE AUTHOR: Lawrence Schimel (New York, 1971) writes in both English and Spanish and has published over 100 books as author or anthologist, including two poetry chapbooks in English, Fairy Tales for Writers and Deleted Names (both from A Midsummer Night’s Press), and one poetry collection in Spanish, Desayuno en la cama (Egales). 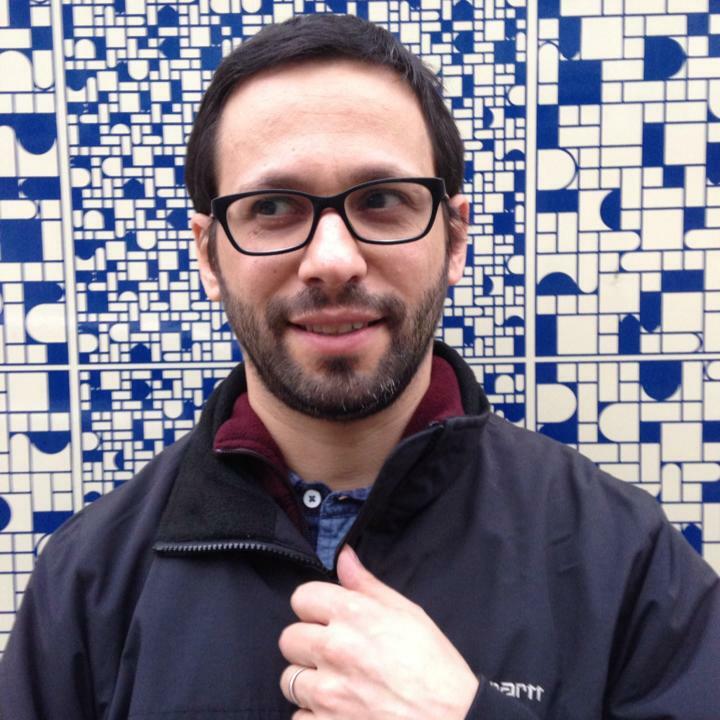 He has twice won the Lambda Literary Award (for First Person Queer and PoMoSexual: Challenging Assumptions About Gender and Sexuality), as well as the Independent Publisher Book Award, the Spectrum Award, and other honors. His stories and poems have been widely anthologized in The Random House Treasury of Light Verse, The Random House Book of Science Fiction Stories, The Mammoth Book of Fairy Tales, Chicken Soup for the Horse-Lover’s Soul 2, The Incredible Sestinas Anthology, Weird Tales from Shakespeare, and many others. He lives in Madrid, Spain where he works as a Spanish->English translator. 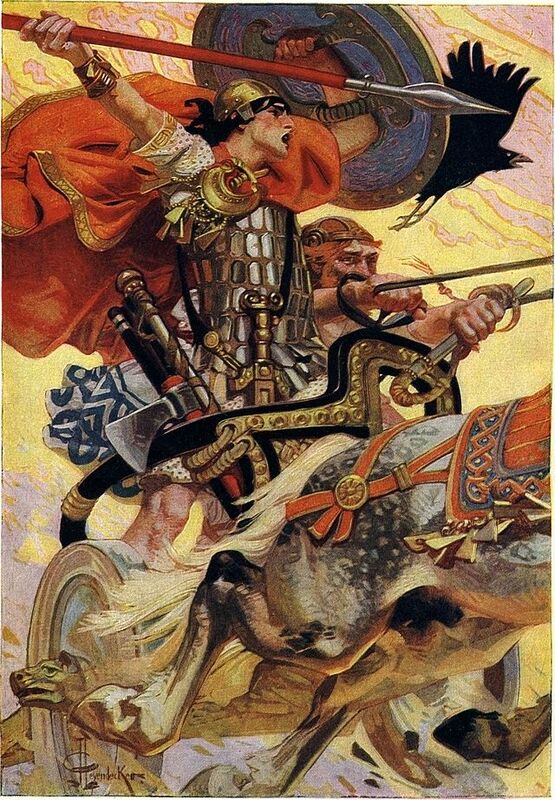 IMAGE: “Cuchulainn, the Hound of Ulster, in Battle” by Joseph Christian Leyendecker (1874-1951). a good job of explaining it to my father. that is where I have left them, anyway. 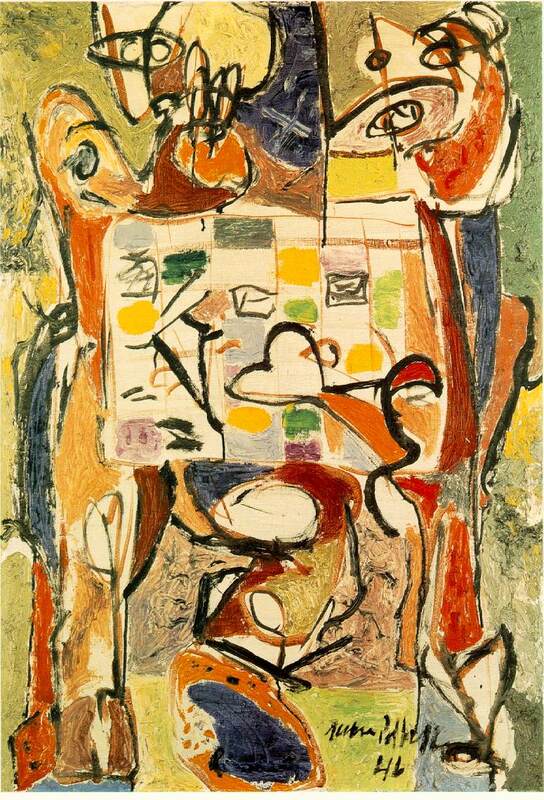 IMAGE: “The Tea Cup” by Jackson Pollock (1946). ABOUT THE AUTHOR: Jennifer Finstrom teaches in the First-Year Writing Program, tutors in writing, and facilitates a writing group, Writers Guild, at DePaul University. She has been the poetry editor of Eclectica Magazine since October of 2005, and her work appears in After Hours, Cider Press Review, Midwestern Gothic, NEAT, and RHINO, among others. In addition, she has a poem forthcoming in The Silver Birch Press The Great Gatsby Anthology. 5. Now crack the wolf and separate the whites–the large eyes, the long teeth–from the yolks. 9. Just before the time is up–the end in sight, the water broken–split the top with a hunting knife, bone-handled and sharp. 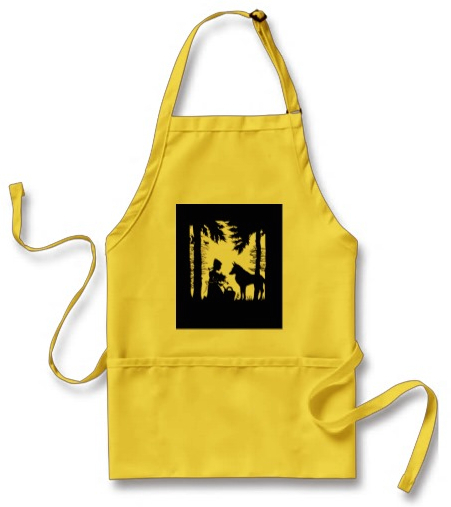 IMAGE: Red Riding Hood and Wolf apron, available at zazzle.com. the wood within nor weather without, but for the first of February. from the village, where in the square, the bonfire had burned since dawn. kindled anew that day on every village hearth. NOTE FROM THE AUTHOR: “The First of February” is based on the Celtic myth of Brigid, goddess of hearth and fire, whose ceremony is celebrated every year on the first of February. The ceremony includes a ritual dousing of each house’s fire, a thorough cleaning of the hearth, and then from a newly-kindled central community fire, all of the local people carry a flame to their own hearths so that all village fires burn with warmth and light from the same source. 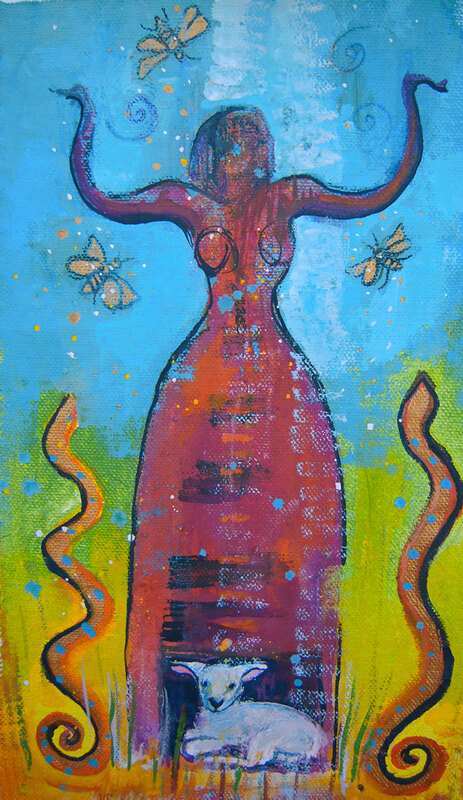 IMAGE: “Brigid of Candelmas” by Judith Shaw. Prints available at etsy.com. 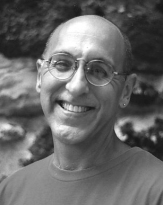 ABOUT THE AUTHOR: Eric Paul Shaffer is author of five books of poetry, including Lāhaina Noon. His poetry appears in North American Review, Slate, and The Sun Magazine; Australia’s Going Down Swinging, Island, and Quadrant; Canada’s Dalhousie Review, Event, and Fiddlehead; Éire’s Poetry Ireland Review and Southword Journal; England’s Stand and Magma; and New Zealand’s Poetry NZ and Takahe. 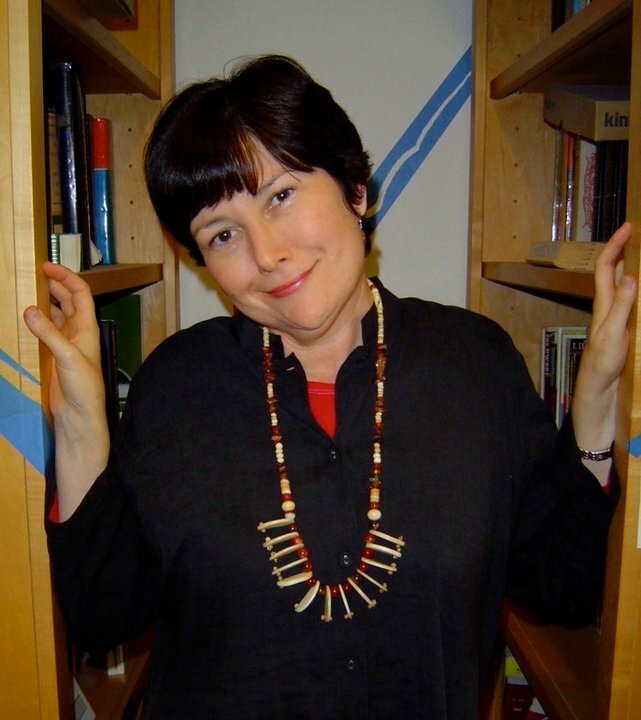 Shaffer received the 2002 Elliot Cades Award for Literature, a 2006 Ka Palapala Po‘okela Book Award for Lāhaina Noon, and the 2009 James M. Vaughan Award for Poetry. Burn & Learn, his first novel, was published in 2009. Shaffer teaches at Honolulu Community College. They take her brother to break her pride. to still the hunger that gnaws inside. throw loaves of bread to the birds. seem a candy house she could devour. The guard tells her: Child, climb into the fire. Gretel tells the guard: Show me how. easily in the camps at Dachau. NOTE FROM THE AUTHOR: “In the Schwarzwald” is part of a sequence I’m writing, using that same title as the title for the series, using the fairy tales of the Brothers Grimm as the lens through which to explore the Holocaust, both arising from the same Dark Forests of Germany. 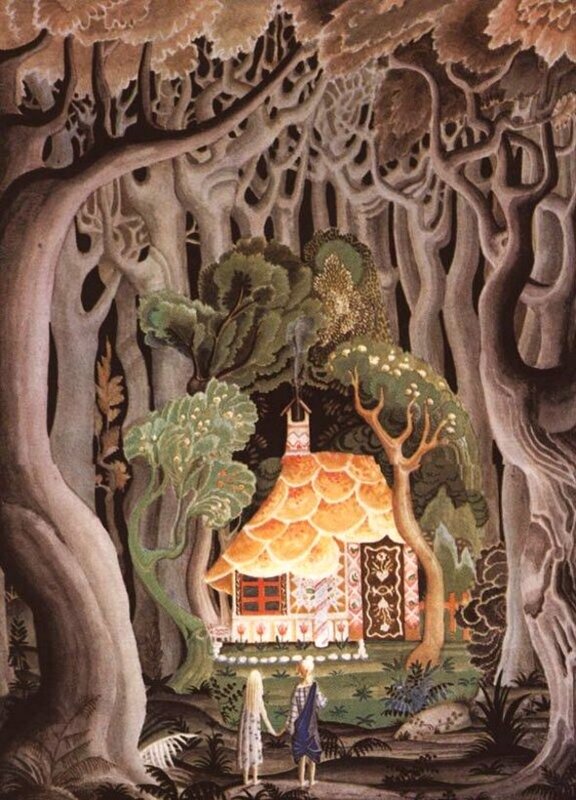 IMAGE: “Hansel and Gretel” by Kay Nielsen (1886-1957). and you are invisible still. once again—you never show yourself. you’ve had to travel by now. I wish for you a magic cloak. ABOUT THE AUTHOR: Linda Ann Suddarth sees the creative life as a vital expression of the psyche. 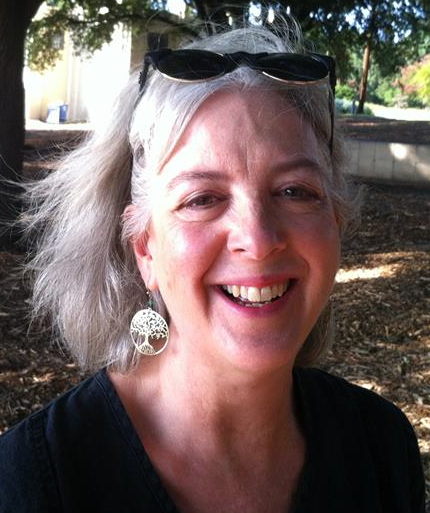 Linda has been writing poetry for 30 years, and has published in many poetry journals. She has a BFA in painting, an interdisciplinary MA in Aesthetic Studies, and a PhD in Mythological Studies with an emphasis in Depth Psychology. Linda is on the Board of Directors for the C. G. Jung Society of North Texas, and teaches English and Art at Richland College in Dallas. For more, visit her blog: lindawordandimage.blogspot.com. 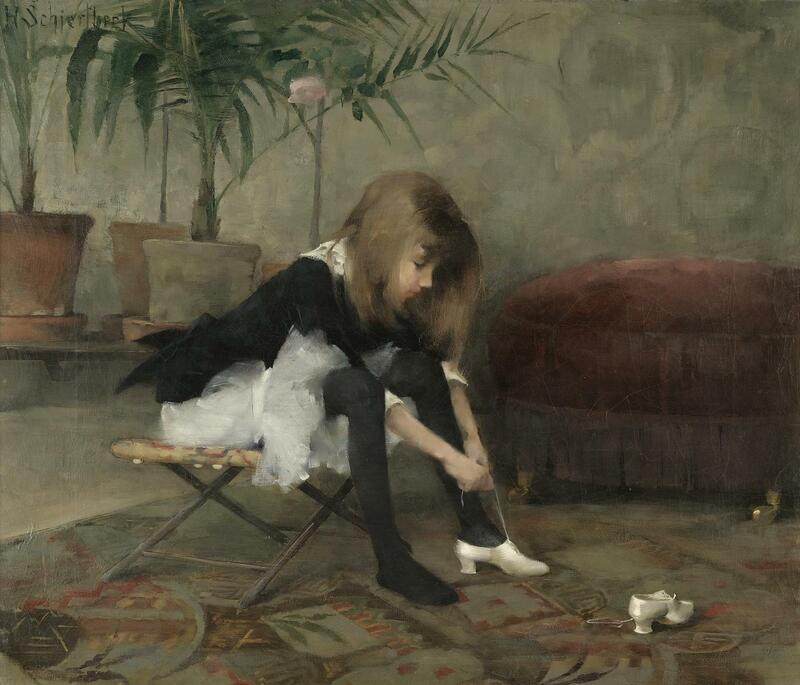 IMAGE: “Dancing Shoes” by Helene Schjerfbeck (1882). he looked back just that once. before they heard his cry. NOTE FROM THE AUTHOR: This poem will appear in my upcoming chapbook, Erasing the Doubt, which will be published on February 28, 2015 by Finishing Line Press. 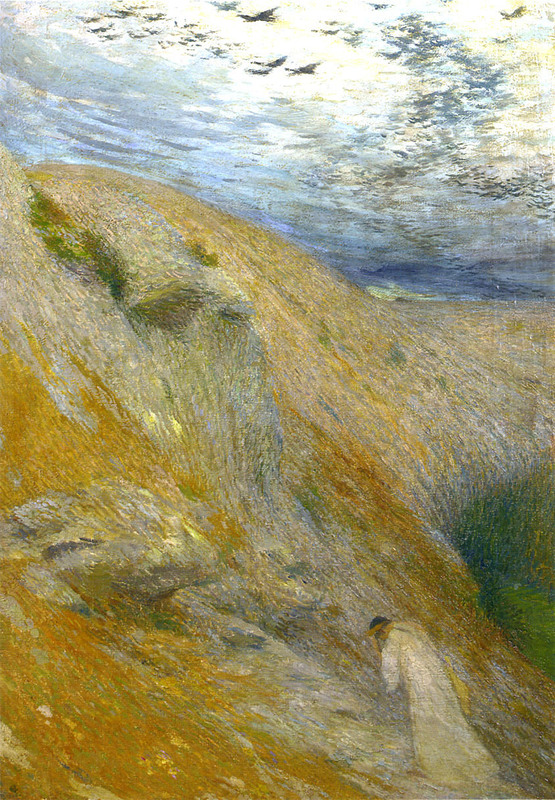 IMAGE: “Orpheus Returns from the Pursuit of Eurydice” by Henri Martin (1860-1943). ABOUT THE AUTHOR: Mary Kendall has a chapbook, Erasing the Doubt, coming out on February 28, 2015 by Finishing Line Press. This poem is one of the selections. Mary is also author of A Giving Garden (2009). She is delighted to find the many excellent poets here on wordpress, and her blog is: A Poet in Time found at: apoetintime.com. She is a retired teacher and using her retirement years to indulge in a good deal of reading and writing. She lives in Chapel Hill, North Carolina. what party she’s going to, if they can take her home after. with the sole of this shoe and not even feel bad. Little robber maidens are not lonely. like the Chicago November when my sister is born. sharp as a shard of mirror splintering from its frame. overhead. Little robber maidens are not lonely. NOTE FROM THE AUTHOR: I recently reread “The Snow Queen,” and I was struck by how much agency and personality the little robber maiden has for a character who plays a fairly minor part in the overall story. She feels like a character who continues having her own adventures even after the protagonist has moved on and taken the story with her—and possibly better adventures, too. 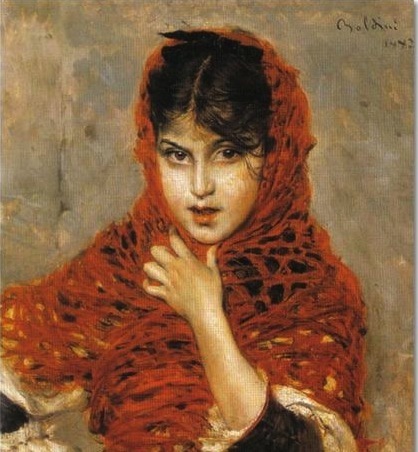 IMAGE: “Girl with Red Shawl” by Giovanni Boldini (1842-1931). ABOUT THE AUTHOR: Elizabeth Kerper lives in Chicago and recently graduated from DePaul University with a BA in English literature. Her work has appeared in Eclectica, NEAT, and N/A Literary Magazine, where she is a contributing editor. She can generally be found sitting quietly in the corner with her nose stuck in a book.